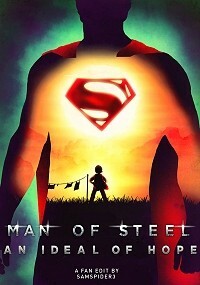 The second film explores the debate and reactions of people to Superman's existence, and our hero experiences the good and bad sides of humankind to the point where he has to choose between hanging his cape or continuing his original purpose. I found this really intriguing, but felt it didn't belong to a sequel. By obligation, this HAD to be in the first one and HAD to be developed before facing a gigantic battle against powerful Kryptonians to justify all this dilemma, and I believed it was the missing piece to really complete Clark Kent's Journey. That's how I envisioned "Man of Steel" when it was released, and It's exactly what I intended to achieve in this Fan Edit. - Clark's origin story is told in chonological order, simultaneously with Krypton's fate. "Memento" style. - Superman's first appearence to the world is in Africa, where the debate about the impact of his existence begins. - The Oil Rig sequence had to be modifiied with scenes from Deepwater Horizon to justify all the Capitol plot point. - No romance between Clark and Lois. - Extended ending to give the feeling of hope, using footage from different ads, and films, like San Andreas, Deja Vu, Deep Impact and Prisoners. Adobe Premiere was used to edit. I went through a lot of small, but important sound modifications to accomplish the perfect transitions between one and other scene in 5.1 audio. I believe it's my most complex work to date. Clark's journey from child to adulthood is shown in chronological order, simultaneously with the most important points from Krypton's fate (Jor-El planning to send Kal to earth). This is an artistic decision inspired by the film Memento. It also allows a more dynamic pace. - Added the Man of Steel Logo at the beginning. - Jonathan Kent's answer ("maybe") about letting the bus kids die is barely heard. Like a whisper. - Jonathan dies crushed by a car during the tornado scene. Based on an idea by TM2YC. - The bar scene was used as the point where Clark begins his quest to discover where does he come from. Scenes from "Deepwater Horizon" were used to make feel more complete the whole Oil Rig incident. It's also the starting point for the whole conflict that will justify the segments from Batman v Superman: Wallace Keefe blames Superman for not saving him in the Oil Rig. - The sequence was trimmed because it was too long. As well as Mark Whalberg and John Malkovich were cut. - Wallace Keefe in pain for his legs audio was used to make emphasys it's him in a "shadowy" scene. - The song that appears when Clark comes out of the water was replaced with score by Hans Zimmer. - Clark sees a Coast Guard helicopter instead of a bus. It reminds him he saved the Oil Rig workers. The story of Krypton told by Jor-El is complemented by the bits not used in the earlier scenes, so they look like flashbacks. This will fill all the holes with the necessary information not present in the first 20 minutes. - Jor-El's narration now is used mostly as voice over. - All the music was changed and re arranged to fit the new editing. Clark’s first flight doesn’t have all the jumping stuff, but we see how he actually struggles discovering he can now fly. - Jor-El doesn’t explain now about the sun’s effect in Clark. I left that for later. We only hear “You’ve grown stronger here than I’ve ever could have imagined” followed by the “Ideal of hope” speech. Lois investigation doesn’t have voice over narration. Tried to keep it, but whatever I did, it didn’t fit well. - To keep in continuity, Martha mentioning Lois going to Kent farm was cut, as this is the scene that happens after the first flight. - A flashback of Jonathan appears when Clark says about his father thinking of people not being ready for someone like Superman. - It was used as base the “Ultimate Edition” version of this scene, but was trimmed to not make it so long. - The special bullet in Lois book was cut because her investigation about it doesn’t happen here. - The African general lines about Superman’s arrival are cut, as in my version he doesn’t know about him yet. Now it looks like he’s frozen and is surprised. - People being burnt by Luthor’s men was also cut. The whole point is to make this scene look like an heroic act, not a tragedy. So now, the lady in the capitol complaining about Superman’s is taken out. The heroic montage then happens. This is where the whole debate of the world about his existence starts, developing the most important aspect. - Replaced the image of Superman’s statue with his “S” logo when Woodburn is giving his opinion. - Clark watching the news was replaced with Lois, because it would not make sense him to have a big LCD tv when he’s a humble farmer. Still, Lois’ reaction is important here. The conflict in the Capitol then takes place: Keefe wants to kill Superman in the meeting for not saving him in the Oil Rig, and it’s the moment where Clark intends to show the world his good intentions, but fails. This causes to lose his faith in humankind, and humankind to lose faith in him, branding him as dangerous and a fraud. - Keefe asks Senator Finch to see Superman simultaneously with scenes from the oil rig as flashbacks. - Shots were re escalated to hide Superman’s statue in the capitol, when Finch makes the public announcement. - Added a shot of the Capitol from “Eagle eye” and a rain filter. Colors were desaturated to match the film and extra were put sound effects. - Bruce Wayne was taken out because he’s not part of this story. - Luthor’s piss in a jar was cut. Explosion happens a bit after the speech in the Capitol. - Clark tells Lois the meaning of the “S” symbol after the explosion. This makes stronger the whole struggle he’s going through: He’s the last of his kind and there’s no hope in the planet. Zod mentioning Clark hiding his existence in the message was cut because he was already exposed to the world. The ultimate challenge to prove the people of earth he can do good is upon him. Clark’s going to have an inner dilemma, about giving the planet another chance, or not doing anything for it, not mentioning how he feels guilty for not being able to save that people in the Capitol. This is where he goes to the mountains for a moment of solitude, where he listens Pa Kent’s story that would make him go back to face Zod. - "The fate of your planet rests in your hands" is heard with reverb when Clark goes to the mountains. - Cut part of the scene with Spanish speaking people of the mountain, as I thought silence has more impact. Battle of Smallville was left intact, as over time, I feel the action scenes are the strongest points of the film. - Cut Lois and Clark staring at each other after he saved her. In this version, Lois is a good friend and ally of Supes, not her love interest. - Cut Martha saying “go to hell” to Zod. 5 years later and I still think it’s a silly line. - Cut Martha saying “nice suit, son”. She already saw him with the suit. Battle of Metropolis was a little bit trimmed to make more emphasys on Clark destroying the World Engine. - Perry, Jenny and Lombard are present, but have less screen time. We still see them in the catastrophe. - Superman coughing was taken out. - Shots of Jenny being trapped while Clark destroys the World Engine were replaced with people running away in panic. - Added Jor-El’s voice over about the effects of Earth’s sun in Superman when he’s trying to get up after destroying the World Engine. Zod and Faora attempting to stop Colonel Hardy of opening the Phantom Zone is edited as they are attacking at the same time. We see a flashback montage of all good and bad moments in earth before Clark decides to save them all. This was thought to not make him sound like a douche when he says “Krypton had it’s chance”, but to streghten his last moment of doubt before taking the right choice. Do you all remember “Wonder Woman” when she was about to kill Dr. Poison? Something similar, but I thought about it way before the film was released xD. Clark and Lois kiss was cut, as they are not in love in this version. Zod trying to kill the random people with his laser eyes was modified to not make them look like idiots who had time and space to escape. Now it looks like the laser didn’t even give them time to think about anything. A whole new sequence created with shots from “San Andreas”, “Déjà vu”, “Prisoners” and “Deep Impact”, where the president of the United States (portrayed by Morgan Freeman) gives a speech of hope. - Sound and music was remixed to fit all the scene. An extended but hopeful ending, where people of earth finally accept Superman as their savior and hero. - Colors were degraded and desaturated to match the rest. - Cut all the “What are you gonna do when you are not saving the world?” lines and replaced them with Pa Kent’s and Jor-El voice overs about Clark’s purpose on earth. - Shots from Batman v Superman ads were added to show the city restored. 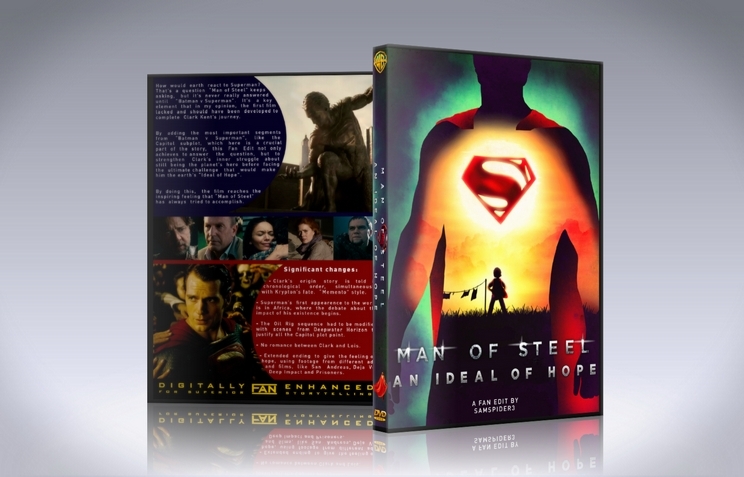 - "An Ideal of Hope" subtitle appears under “Man of Steel” at the end. - My name after the credits was added. This was an edit I remember being really excited about when it was first announced, and I loved the redone clips I saw on the idea thread. Sadly, the product as a whole didn't really work for me. First off, a lot of what Billy Batson said about the oil rig scene was true (too much conflicting imagery, not sure why certain things are happening), and while I likes the BvS portion, it did feel like it went as quickly as it came. What would help would be if Lois investigations bringing her to Smallville came after the Nairomi scene, just so the audience feels that the world knows Superman a little longer. Also, would keep the oil rig flashbacks while Wallace is in his apartment, not in the senator's office. Aside from that, there's not enough footage to do a chronological view of Clark's life without feeling too short, disjointed, and repetitive. It also hurts other scenes, because Clark just tells Lois not to publish the story because his dad said no and she just goes along with it. One positive thing I can say though is that all the ideas to flesh the world out show that they can be done though, especially with that new ending, where it really works. I can say that alone is reason enough to recommend the edit. The good: Technically flawless editing and nice trimming of some of Snyder's misplaced angst. The nits: Although the idea of fleshing out the action on the oil rig with footage from DEEPWATER HORIZON to set up the later inclusion of the Capitol subplot from BATMAN v SUPERMAN was interesting, it doesn't really work for me, and led to what I feel were some awkward editing choices and plot holes. For example, samspider3 has moved the scene at the Canadian bar so that it now occurs prior to the sequence with the Alaskan fishing boat and the oil rig. But at the bar, Clark overhears the Canadian soldiers talking about the discovery of the alien craft on Ellesmere Island, so when he quits his job at the bar and begins hitchhiking north, why did he take the time to make a side trip to get a job on an Alaskan fishing boat? I've looked at a map of Ellesmere Island, and there's nowhere in Canada that will take you through Alaska to get there. It would be like going from Houston to Chicago by way of Seattle, without the advantage of gaining any frequent flyer miles. And speaking of frequent flyers, what's the deal with all of the helicopters? In the extended oil rig footage, we open on a helicopter approaching an oil rig which is clearly labeled as the Deepwater Horizon (which was never stationed in the Arctic and is therefore as out of place as the Titanic would have been). But who's on the helicopter and why is it flying towards the oil rig? We never find out. It obviously has nothing to do with the explosion on the rig, as we see the explosion occur a short time later. Then, after the explosion, we have a separate U.S. Coast Guard helicopter making "one more pass" by the rig to look for survivors when Clark brings the crewmen out on the helipad. After the rig is apparently destroyed, we get some more footage from another movie (DEEPWATER HORIZON again?) suggesting that at least two crewmen have been left behind, one with his legs injured, which nicely sets up a motive for the later tacked on bit of the explosion at the Capitol building. But who saved these last two crewmen? The Coast Guard helicopter had already made its last pass, the rig's blown up and Clark's communing with the undersea whales. Later, when Clark swims ashore in Alaska, he looks up and sees yet another helicopter (this one orange in color) flying overhead, which apparently gives him pause for thought. Is this supposed to be some rogue helicopter that somehow saved the two abandoned crewmen after the rig was destroyed? While pondering this question, we immediately cut to yet another helicopter (of a different color) landing on Ellesmere Island with Lois Lane on board, where she's met by Clark. Maybe it was Lois in the orange helicopter? It's all a bit confusing. And all of this was added just to set up the tacked on bit from BATMAN v SUPERMAN, which while it does add a bit of depth to Superman's character, feels episodic because it isn't integrated into any other parts of the movie. If this scene had been originally included in MAN OF STEEL, as a fan editor I'd have cut it because it doesn't really add anything to the plot. I imagine this sounds a bit harsh but it isn't really meant to be. Overall I liked this cut better than the release version of the film. And given the higher scores left by other reviewers, I'm probably in the minority on this. I enjoyed a lot this edit, as I always do with the samspider3 edits, in fact, this is one I was waiting for a long time. The parts I really enjoyed were how the structure and incorporation of the new scenes from other movies to add a new villain, it just gave a whole new insight in how Superman sees himself in this world and I thought that was fantastic. Another great thing about this edit is the structure in the end, it gives such high hopes for the character, I believed it was great. Thanks again for an incredible edit. A vast improvement over the original, this edit transforms Man of Steel into a more complete and fulfilling Superman experience. Subtle changes improve the character of Clark/Superman and re-arranging the scenes of Krypton and Clark's youth allow us to feel more a part of his journey. Using scenes from other movies (which are added seamlessly), this edit includes a new introduction of Superman to the world, with different repercussions. I found that the restructuring and additions, without all of the strings attached to Batman v. Superman, really let you experience Clark's side of the story in a different light. This added investment in the character and the story lead to a much more meaningful and powerful confrontation with Zod. An Ideal of Hope works very well as a standalone Superman movie but hints at a larger world without trying to stuff it all in one movie. It implies that Superman has been in action for some time, references Luthor, and hints of budding romance with Lois - this is the version I wish I saw in theatres. Due to borrowing scenes from Batman v. Superman, there are some continuity issues with the other DCEU movies but the result is thoroughly satisfying and entertaining - I can't recommend it enough. In an attempt to better balance out the themes and messages behind Snyder's vision, samspider3 has taken a unique approach to the first outing for the DCEU's take on the man of steel. Throwing in essential story beats from Batman v Superman and stitching it together with bits from a different movie (with a similar incident) to create a whole new element that weaves in and out of the existing MOS footage, giving us a world reacting to this stranger from another world in thier midst, but divorced from the convoluted scheming of Lex Luthor or the quasi-murderous intent of the Batman. Minimizing the romantic elements for Lois and Clark does not diminish their bond either. This edit captures the essential essence of fan mixing and really is what fanediting is all about.